Waste canvas is made up of woven threads that are held together with a type of starch, which dissolves when wet. It works a bit like a template. guiding you where to put your stitches when the fabric you are stitching on doesn't have an evenly woven grid of holes to use. Once the work is complete, remove the canvas and you're left with a decorated garment. Adding embroidery or cross stitch on clothes is becoming more and more popular and it is easy to do. You could also use it to ensure that your seam treatments on crazy quilt blocks are evenly spaced. Or why not decorate a purse or bag with counted embroidery? You can use any design for cross stitch on waste canvas. You could start with my free cross stitch patterns. The canvas comes in a number of different sizes, including 9, 10 and 14 threads per inch. Now before you jump in and start stitching, there is a bit of preparation to do first. Check the size of the design you wish to cross stitch and cut the waste canvas a little larger. I tend to add 2 to 3 inches to each measurement. Just like with normal cross stitch, find the centre of the canvas by folding it in half both ways. You can mark the centre with a pencil as it won't remain in your work when you are finished. Decide where on your item you want to stitch and lay the canvas over the area, making sure to try to line up the fabric and canvas threads if possible. You don't want your motif to be wonky do you? 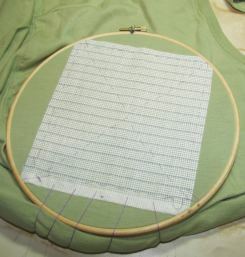 With a sharp embroidery needle and normal sewing thread, tack the canvas to the garment. I start in the centre and work diagonally out to the corner. Then repeat for the other three corners. Finally I put a line of tacking stitches around the outside edge of the canvas to keep it in place more securely. Then pop the "sandwich" into an embroidery hoop. It is a good idea to pick a big enough hoop so that all the area to be stitched is enclosed. I try not to have to move the hoop if I can help it. 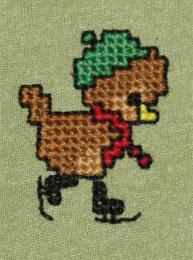 The little robin I have stitched for you is on a tee-shirt. Being a large lady there was a lot of excess tee-shirt, so, as you can see in the photo, I rolled up the excess at the bottom and took some large tacking stitches over the roll and into the selvedge of the canvas to keep it tidy and out of my way. Depending on the fabric you are working on, you may find a sharp needle easier than a blunt tapestry needle. Work from the centre out if you can so as to avoid any puckering of the fabric. Using the holes in the waste canvas work your cross stitch in the normal way, being extra careful not to leave gaps where the arms of the cross stitches meet. If you find this tricky you could always use the tiny holes where the double threads of the waste canvas meet instead of the larger ones. The starch or glue in the canvas is water soluble so it needs wetting to help you to remove it. I used the spray function on my iron to dampen it, but you could also wash and dry the whole garment before tackling the next step. 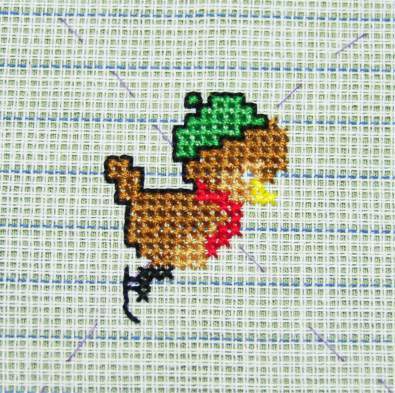 Start by removing your tacking stitches (or at least those that are visible - the cross stitches may cover some of them). Now raid your manicure set for a pair of tweezers, or find a pair with a little magnifier attached if you have some. It is also a good idea to have a little pot or something handy to collect all the loose threads you are going to remove. Concentrating on one thread at a time, gently grab it with the tweezers and pull it out from under your cross stitches. Be extra careful if the stitches hold it down in more than one place. In my robin some of the threads first go under his boots, then later are positioned under his body. The photo shows this step in progress. Take your time, don't rush. 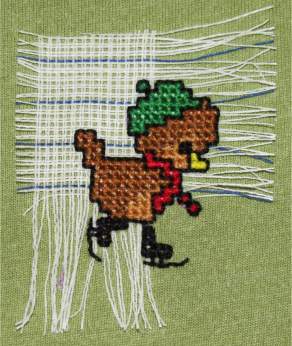 Try not to yank the waste canvas threads from under the cross stitch. Remove all the threads to leave your design sitting proudly on your garment. Good job!